The board members of the proposed Athens County Transportation District will hold a special meeting for the purpose of electing officers, reviewing organizational bylaws, establishing regular meeting dates, and reviewing proposed projects. The meeting will take place on Thursday, May 29,2014 at 10am at the Athens County Engineer’s Office. The Athens County Engineer’s Office is advertising for bids on the CR 110 Poston Station Road Culvert Replacement Project. Look at the Bids and RFP’s page under the “Information” menu for more details. A winning bid of $561,290.60 was submitted by R C Construction Company and Son, Inc. of Cutler, Ohio for the County Road 85 (Big Run Bridge) Project. This project will replace the existing structure on Big Run Road over Federal Creek. Construction is planned for June 2014 with a completion date of November 1, 2014.  We hope you enjoy the new website of the Athens County Engineer’s Office! We are still adding and updating information, so be sure to check back and visit as we get used to our new surroundings.